The RoboVikings team is comprised of seventh and eighth grade members of the Santa Monica Science Magnet. We participate in FIRST Tech Challenge, which is a worldwide robotics competition for seventh through twelfth graders that emphasizes hard work, innovation, and creativity while teaching teenagers the importance of working together, sharing ideas, and treating each other with respect. After the annual competition is announced each September, the group meets on Friday afternoons and Saturday mornings to design, build, program and practice operating the robot to win points in regional competitions that begin each December. Depending on how far the team advances, competitions happen every two to four weeks until the World Championship meet occurs in April. The RoboVikings team is full for the 2018-2019 school year. New members will be added to the team for the 2017-2018 school year. If you are interested in applying next year, you must be entering 7th or 8th grade and a member of the Santa Monica Science Magnet. Please refer back to this page in the summer of 2019 for information about the application process, which begins during the Science Magnet Summer Institute in August. First Tech Challenge competition season underway! HELP FUND OUR ROBOVIKINGS NOW! RoboVikings: Our Rookie Year was a Winner! 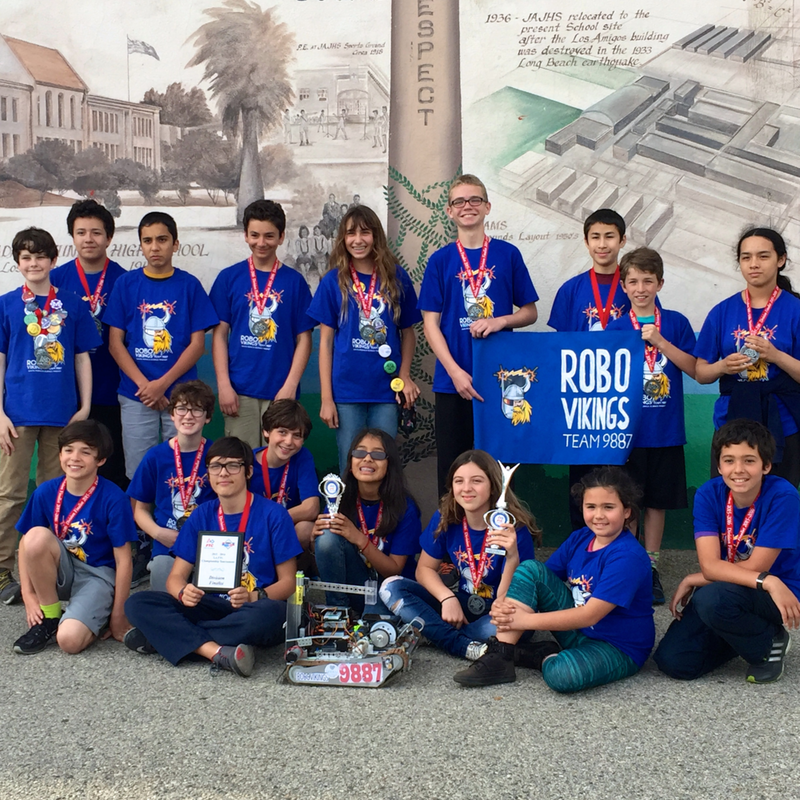 It was an exciting year for JAMS’ newly-formed RoboVikings team, SMMUSD’s first team to enter the FIRST Tech Challenge (FTC®) worldwide robotics competition. “This is big step for our school,” said JAMS Principal Steve Richardson. “Beyond the alignment to 21st century skills, this pilot program will expose our students to the iterative engineering design cycle.” FTC is a robotics competition for grades seven through 12 that promotes project-based learning using real-world math and science concepts. Over 50,000 students on 5,000+ teams around the world participated in FTC’s 2015/2016 season. As the team got started, the RoboVikings broke into several sub-teams under the leadership of Coach Mohamed Abid, who brought to the team a wealth of expertise from his years leading engineering projects at JPL and NASA. Those teams worked on a variety of tasks important to the robotics competition, from robot design and building to programming, and from computer-aided design (CAD) and 3D printing to community outreach and fundraising. The world of FTC is not just about building the best robot, but learning to work with others – including students from other teams, parent mentors, and local businesses – with “gracious professionalism,” a way of doing things that encourages high-quality work, emphasizes the value of others, and respects individuals and the community. All that hard work paid off for the RoboVikings, who qualified to advance to the regional finals based on their participation in their very first competition last December. Not only did the team’s robot score well in matches that day, but the team won the “Motivate Award” which goes to the team that exemplifies the essence of FTC through team building, team spirit and exhibited enthusiasm. At the regional finals this spring, the team fought fiercely down to their very last match, which was their absolute best performance in the whole season! Although the RoboVikings didn’t end up qualifying to advance further, it was an amazing performance against students and teams with much older and experienced members. At the end of our first season, we are very proud to say that our rookie team ended up amongst the Top 10 teams in Southern California! Go RoboVikings!